Our topic for the Autumn term was ‘The Great Outdoors'. We looked at plants and animals and the habitats that they live in. There were lots of opportunities during this topic to use our science skills. We made a moving habitat picture using different mechanisms. We also studied light and dark and objects which are light sources and those which are reflectors. We then designed and made a bag which could be easily seen during the dark winter nights using our science knowledge. In RE we were thinking about 'Chosen People'. We thought about how we have been chosen by God to follow his teaching. We looked at the stories of Abraham, Moses and Daniel and think about how God guided and protected them. We also looked at the topic of 'Mysteries' where we reflected upon the birth of Jesus Christ during Advent. 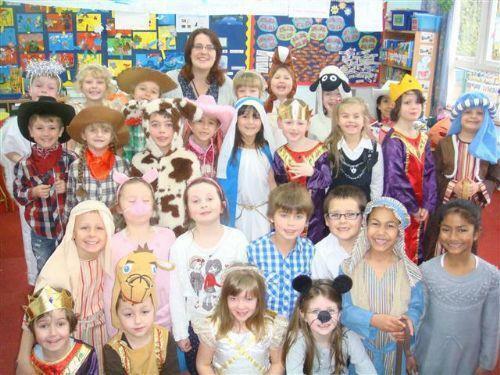 We all took part in our super Christmas production called 'Prickly Hay'.